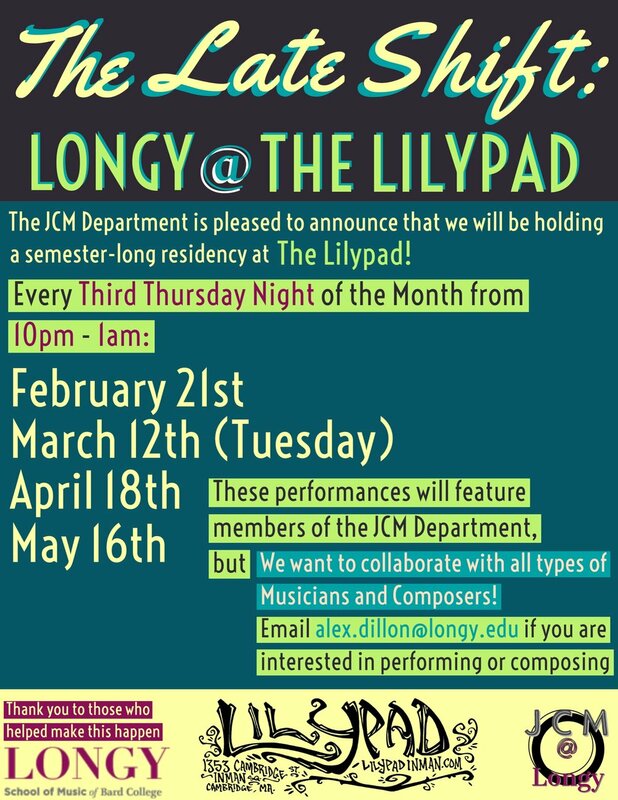 The JCM Department at Longy is very excited to announce that we have snagged a monthly residency at the illustrious Lilypad in Inman Square, Cambridge. This is an unparalleled opportunity for our Jazz and Contemporary Music students to perform, experiment and collaborate in preparation for becoming professional musicians in the real world. Come and listen to what the more jazz inclined students at Longy have been working on inside and out of their regularly scheduled ensembles and classes. We have some real hip cats to showcase so it should be a great night of music. Please consider coming and bringing a few friends. The JCM Department would like to thank the Longy School of Music of Bard College and The Lilypad for helping to make this opportunity possible.